Some boaters like to take their time, enjoy the open water, and not rush to get anywhere. Boating time is relaxing time. Put four engines on the back of a powerboat you can still take your time and relax…as you roar across the water at nearly 80 miles per hour. 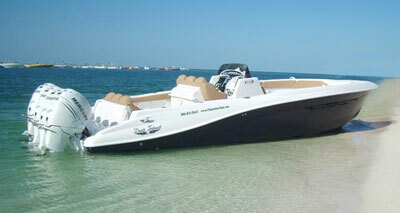 The Quad Engine Deep Impact Power Boat is an extreme center console boat designed for speed, right down to the materials used to make the hull. No boat ever looked so fast even when sitting on a quiet beach. 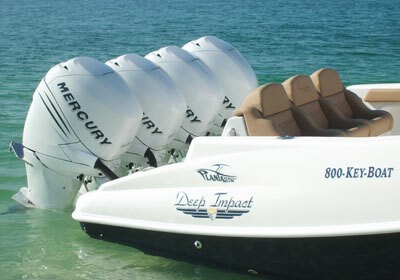 After the successful launch of the new Quad Engine Deep Impact Power Boat in September of 2007 (that weighs in excess of 15,000 pounds and gets up to speeds of 80 miles per hour plus), Deep Impact Power Boats is undoubtedly one of the most extreme center consoles of 2008. Deep Impact Power Boats, which come in lengths of 33’ and 36’ with the option of twin, triple and now quad engines, have exceptional performance ability when reaching excess speeds, a fuel efficiency of 1.1 mpg at 65miles per hour and ride unlike any other center console as a result of their twin-step hull design. Along with this, the extreme build and level of quality of Deep Impact Power Boats is incomparable having a fully glassed together hull and Kevlar lining throughout that includes a second lamination schedule. In addition to this, all Deep Impact Power Boats are built, and fully customized, exactly how the buyer wants it and is unlike what any other center console builder can do for their customers. Whether a fisherman, luxury or performance boater Deep Impact Power Boats has something for everyone looking for a center console. When we evaluated the continued growth in both interest, and the multiple orders, of the Deep Impact Power Boats despite an industry wide slowdown, it just reconfirmed our belief that customers are searching for the most for their money,” commented Elias De La Torre, President of Plantation Boat Mart and Marina. Since the launch of the Quad Engine Deep Impact Power Boat in September of 2007, three Quad Engines have been sold for a total of six Deep Impacts from September to December. Currently, only twelve to fourteen Deep Impact Power Boats are built per calendar year.